It’s currently pledge season on Public Television, so WEALTHTRACK might not be airing on your local channel. Consequently, we are revisiting some recent interviews that have been of great interest to our viewers. A rare interview with Great Investor and Morningstar’s 2016 Domestic-Stock Fund Manager of the Year, David Wallack. You can watch it again here. NEW THIS WEEK: With geopolitical tensions rising gold has been advancing as well, assuming its traditional role as a hedge against disaster. But Tocqueville Gold Fund’s (TGLDX) Senior Portfolio Manager, John Hathaway writes there is a compelling fundamental case to be made for bullion’s strength and select gold company stocks, which we believe is worth reading. 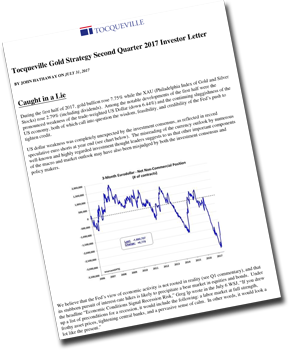 Download the Tocqueville Gold Strategy Second Quarter 2017 Investor Letter here.